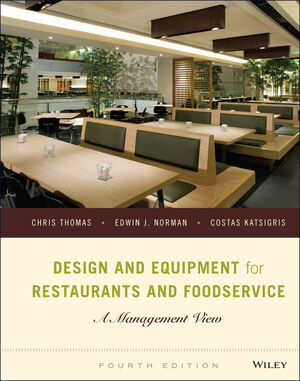 This student friendly text covers how to plan, design, and purchase equipment for a restaurant, or foodservice facility. Design and Equipment for Restaurants and Foodservice offers the most comprehensive and updated coverage of the latest equipment and design trends to help students acquire the knowledge they need to go into the industry. Costas Katsigris is Director Emeritus of the Food and Hospitality Services Program at El Centro Community College in Dallas, Texas, and Adjunct Lecturer at the University of North Texas in Denton, Texas. He is also co-author of The Bar and Beverage Book, Third Edition, published by Wiley. Chris Thomas is a professional writer who specializes in food- and wine-related topics. She also is co-author of The Bar and Beverage Book, Third Edition, and Off-Premise Catering Management, Second Edition, both published by Wiley. She divides her time between Boise, Idaho and Seattle, Washington. Edwin "Ed" Norman, new coauthor of this sucessful text, adds years of real consulting experience to this edition and brings some exciting changes to the look and content of the book. Chapter 2 includes multiple new illustrations to augment explanations of flow patterns in kitchen design. The goal: Don’t just try to fit equipment into a space—make the space work for you, and for the equipment you will need to produce a particular menu. New section on environmentally friendly cleaning supplies, as well as details about the benefits and challenges of composting foodservice waste. New examples of Facility Designs and two new Conversations with people who are design experts in their fields. Added information about energy-efficient advances in lighting technology and heating, air conditioning and ventilation (HVAC). The chapters are organized roughly according to the steps one would take to open a restaurant, or foodservice business.